3D printed fashion: Why is additive manufacturing interesting for fashion? In the recent years, the use of 3D printing in the fashion industry has been increasing: during the creative process, for prototyping or even for production, additive manufacturing gives fashion a wide range of possibilities and fascinates some designers. Since the beginning of the 2010’s, the 3D printing technology has been more and more accessible and now allows new creative experimentations, pops up on numbers of runway shows, and gives consumers a new mass-customization solution. How is 3D printing used in the fashion industry today? What more does it bring in comparison to traditional processes? As many other technologies, 3D printing fascinates us, but it also crystallizes some misconceptions. What are the best 3D printing projects when it comes to fashion design? From 3D printed clothes such as 3D printed dresses or 3D printed jackets, or to other applications for accessories and jewelry, how are fashion brands embracing this revolution? Let’s review the best 3D printed fashion projects. 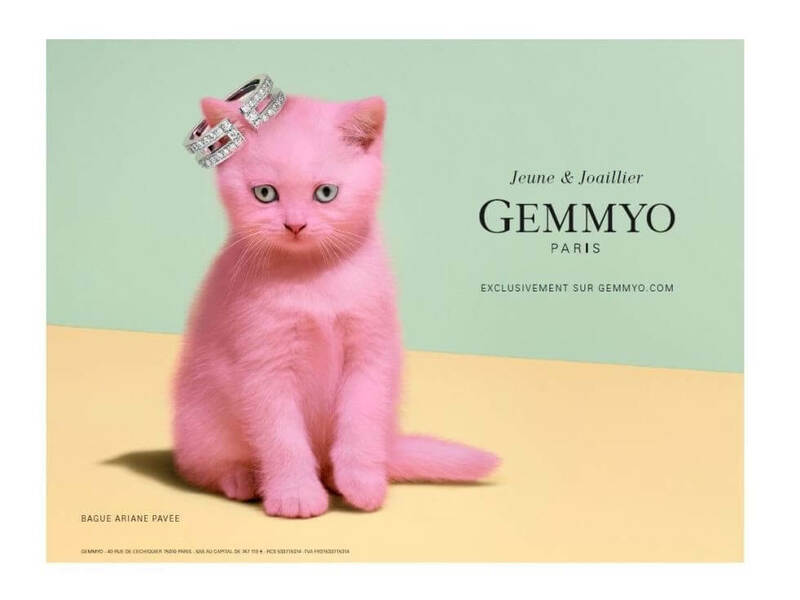 This article was written by Futur404, one of the most renowned Fashion Tech media. Check their website for more updates on the future of fashion. What can we 3D print in fashion today? For the time being, additive manufacturing is more easily applied to rigid creations and geometric shapes, rather than flexible garments. Thus, the first pieces printed in 3D were “integral” pieces, as the one presented by the Dutch designer Iris van Herpen during the ready-to-wear fashion show “Crystallisation” (2011). Produced in collaboration with London architect Daniel Widrig, the parts were printed using SLS (Selective Laser Sintering) 3D printers. CREDIT: SCHOHAJA / PANGOLIN DRESS, THREEASFOUR. 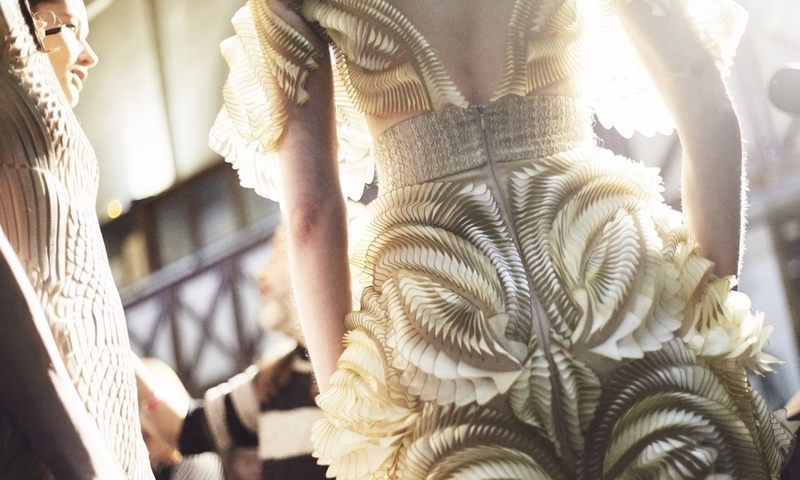 3D printing can significantly expand creative possibilities for fashion design. Indeed, it makes it possible to create shapes without molds, and thus to manage to produce elements of an extreme intricacy that one could not reach otherwise. Nevertheless, the rigidity of the existing 3D printing materials does not allow, for the time being, these creations to be seen outside runway shows, galas, and museums. In addition, the printing itself of these pieces still takes a lot of time (count 500 hours for a dress like the Threeasfour Pangolin dress above), without mentioning the assembly of the various pieces that compose the garment, after it has been printed. CREDIT: THE BIRTH OF VENUS, DANIT PELEG. To overcome the rigidity constraint, today, most 3D printed garments are built using mesh systems, as seen on Danit Peleg‘s collections since 2015. The Peleg case is interesting in the sense that the designer used home printers to print, at the time, her entire graduate collection – while having no specific background in this technology. Since then, she has created new 3D printed designs, including the first fully 3D printed bomber, available here. Peleg embodies the “maker” aspect (the culture of doing, where the emphasis is on “an innovative use of technology and encourages invention and prototyping” – according to Wikipedia). When it comes to the fashion industry, the direct application of this movement would be to 3D print one’s clothing at home, reducing lead times, but requiring certain skills in product design to create unique 3D models. NASA is also working on it, with the project to print a 3D mesh coat for cosmonauts. 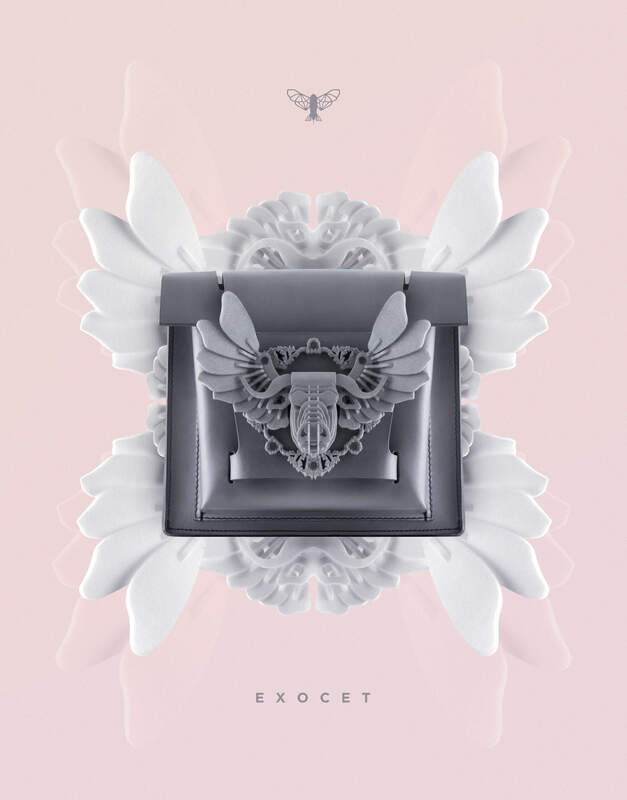 Finally, 3D printing can be used to make ornaments for traditional textile, approaching the idea of a “jewel” for garments, much like the 3D printed clothes developed by the young Anastasia Ruiz in collaboration with Sculpteo; the elements of a garment (buttons, rings …) or even leather goods, like the Exocet Paris bags. Here, it is mainly TPU (thermoplastic polyurethane) 3D printing material and other polymers such as polyamide that are used. 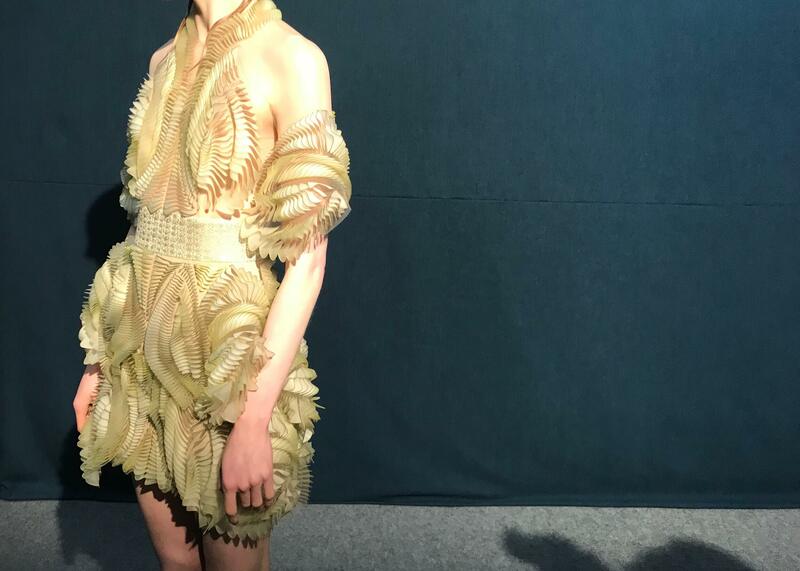 More recently, during the Spring Summer 2018 fashion show of designer Iris van Herpen at the Paris Fashion Week, the ornaments of one of the dresses presented were 3D printed using the PolyJet technique, which allows to create pieces of high-quality resin, with a smooth surface. It works like a 2D inkjet printer: the printer projects small drops of a photopolymer liquid that is instantly treated with UV light. To learn more about 3D printing techniques, check out our 3D Printing Guide on Futur404. Initiated in collaboration with the Delft University of Technology, the “Foliage” process was used to print sheet-shaped patterns as thin as 0.8 mm, essential in the creation of this dress by Iris Van Herpen. Tulle was then laid into the 3D printer to print directly onto the fabric, creating exceptional softness. To do so, researchers developed a parametric model to translate 2D patterns into 3D data. Three variations of this material were altered on droplet level, achieving the color and transparency. 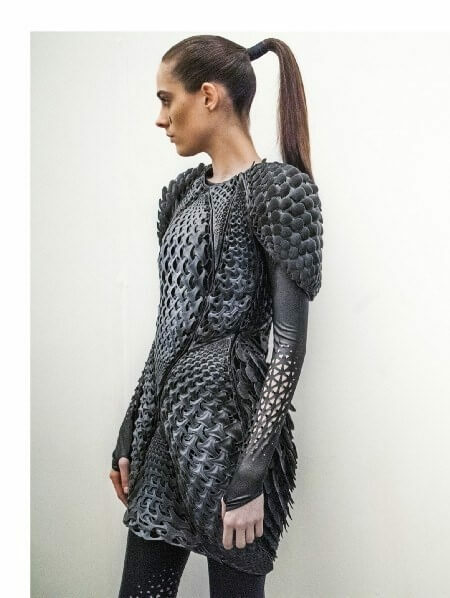 This disruptive process made the creation of this Iris Van Herpen 3D printed dress possible. We might wonder what the next innovation from this designer will be for the next fashion week. Beyond the manufacture of ornaments, 3D printing also saves time and / or money on the production of metal parts of leather goods. This allows to produce on demand, to test new parts quickly, but also to reduce costs: as 3D printing only uses the necessary material, it generates no waste. This is extremely useful when it comes to metal 3D printing since the materials used can be quite expensive. A good way to minimize costs is to use technologies such as metal binder jetting, which can print stainless steel at a reduced cost. Whether for printing the entire or only parts of the product, additive manufacturing is particularly suitable for fashion accessories and especially for glasses or umbrellas. 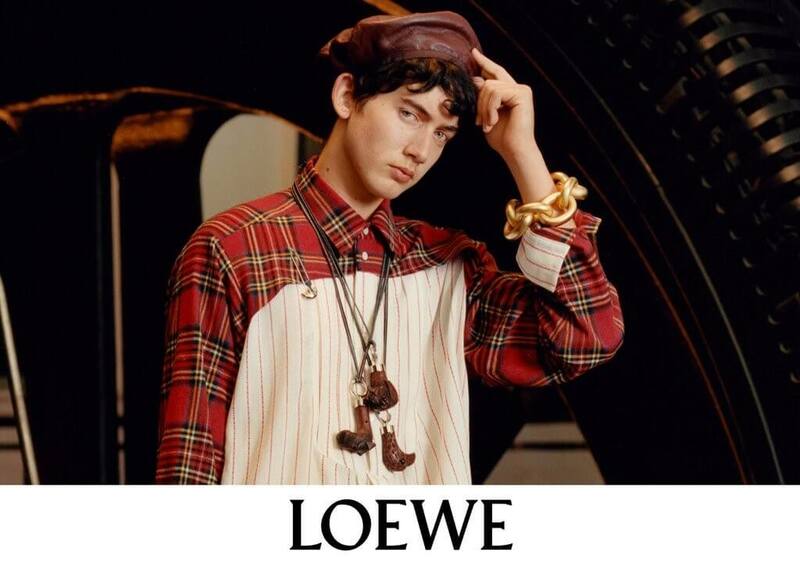 It is also widely used for costume jewelry, as seen in collaborations between luxury brands and VOJD Studios (LOEWE, Alexander Mcqueen, Prabal Gurung …). Prototyping: to produce molds for complex and technical parts. Houses like Cartier or Goossens (part of Métiers d’Arts Chanel) use 3D printing to save time and reduce costs, thanks to the use of casting. Direct production: Gemmyo has been using 3D printing to produce its simplest parts quickly and reduce storage costs since 2011. At the beginning, all the jewels sold on their website were computer-generated images of 3D modeled jewelry, upon which the customers could make their choice. Then, upon order, the jewels were 3D printed. Today the firm mainly sells already produced jewelry, in its physical stores and on its website. 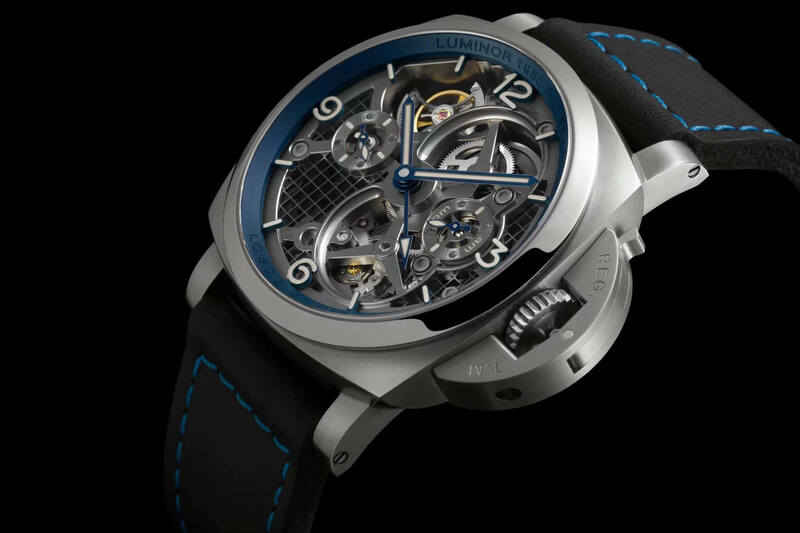 In the watch industry, 3D printing can also be used for prototyping but also for manufacturing, as seen in the latest Panerai Lo Scienziato Luminor 1950 Tourbillon GMT Titanio which case is 3D printed, through the Direct Metal Laser Sintering technique (DMLS). 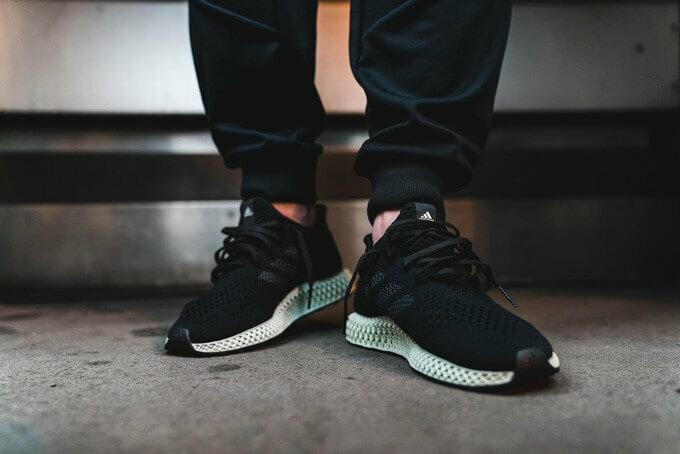 As for footwear, 3D printing is widely used by sneaker brands: Nike, Adidas, New Balance, or Reebok to name a few, major brands have tried it out with varying degrees of success. One of the major interests for the technology lies in the possibilities of customization: take Adidas Futurecraft. Unlike traditional techniques, 3D printing would allow Adidas to address the specific needs of each customer by printing each sole according to the foot of its customers. In addition, printing a 3D outsole allows you to configure its structure to maximize the performance of the final shoe: accentuate more pressurized areas and make points with low pressure more flexible. A project that has not yet reached the mass adoption stage, but prefigures a real revolution: the soles created by this method incorporate a multilayer structure that could not be developed with traditional molding techniques. Finally, a use that we do not often think about, that of machinery spare parts. Indeed, many parts of industrial sewing machines and other machines used to make clothes, are very expensive or for some, they are no longer produced. Some luxury houses are currently using 3D printing to replace parts such as custom-made sewing machine stands. Textile printing, soon a reality? Beyond relatively soft plastics like TPU, companies are working on the development of textile printers. This is the case of the company Tamicare, on which very little information is available; and late Electroloom. 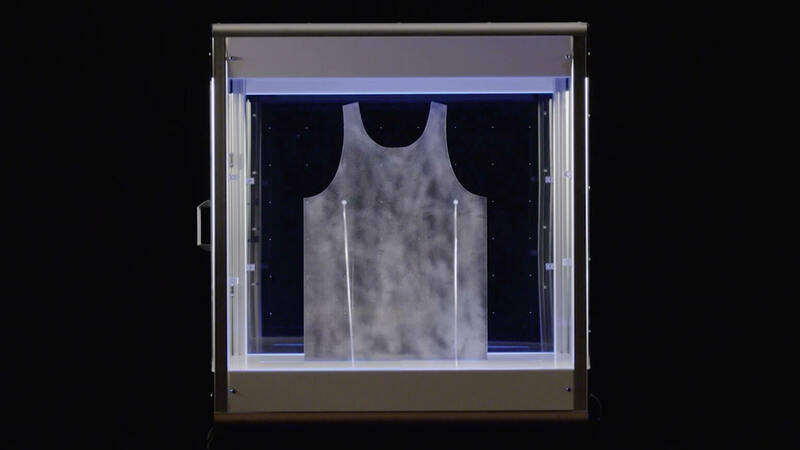 Founded in 2013, the startup did launch a beta test version of its textile printer (on Kickstarter), which sprayed a nylon solution on a metal mold, where the fibers could then aggregate together. Despite the potential of technology, the printed “fabrics” do not last long and were not washable. Finally, one by one, brands disengaged from the project, leaving the startup to shut the door last year. Researchers from structures such as the MIT or the USC School of Cinematic Arts are also working on the case of the development of flexible materials for 3D printing. Challenges and advantages: what does and will 3D printing bring to fashion? Optimization of production processes, customization possibilities, cost optimization (storage with on-demand printing, manufacturing as there are no material scraps, but also for prototyping …), or creation of complex shapes… 3D printing opens new creative fields for the fashion industry and allows to add up cutting-edge technology to traditional techniques. Despite the current obstacles (rigidity of materials, environmental problems, costs and accessibility); it already offers interesting perspectives in the category of accessories, and is increasingly used in jewelry, watchmaking and of course, footwear. Additive manufacturing could totally change the fashion industry, and it’s already starting to shape the future of fashion, both for Haute Couture and for Ready-to-wear. An area to watch closely, where progress happens fast. Consulting firm Gartner, which defines the fashion category under the terms “3D printed Wearables”, places the current period at the very beginning of its famous Hype Cycle for Emerging Technologies. A crucial period for the future of this technology in the fashion sector, which sees many players position themselves in the market. They will have to accompany the professionals of the sector in the appropriation of the technology so that it becomes integrated in a natural way to their usual practices.